No matter the size of the opening, Twin City Glass Co. will build the window to fill it. We have the experience to install large, single pane windows for storefronts, multiple-paned windows and curtain walls that span the entire building. And it’s more than just cutting the glass to fit. We take into account the design and requirements on all of our projects. From the style desired by the building owner to the technical aspects to adhere to safety codes. We also keep up to date all all technological advances in the industry, where windows, frames and trim combine to have almost as much insulation as the walls holding them in place. In many cases, commercial window needs have already been established before construction even begins. We can build and install any window to the specifications provided by the architect and owner, making sure each window is built to style guidelines and code requirements. Once we get the plans, Twin City Glass Co. will provide a timely turnaround for both the windows and installation. As is the case with many older buildings, the existing windows just weren’t built with today’s codes and designs. Twin City Glass Co. has been in business for more than 90 years and has evolved along with the new technologies that make newer windows look great, safer and stronger. In other situations, where an older building needs to be transformed for a newer business, we can remove existing windows and framing and replace with materials required by the new building owner or business. We make sure all of our windows meet energy codes as well. In cases where a few broken panes, or an entire damaged storefront window, needs to be replaced in a building, Twin City Glass Co. works quickly and safely to get your business back to work. Any lost time due to broken windows can affect the bottom line, whether you need to close down before the replacement windows can be installed, or if the broken windows gives the business a bad impressions for walk-in traffic. 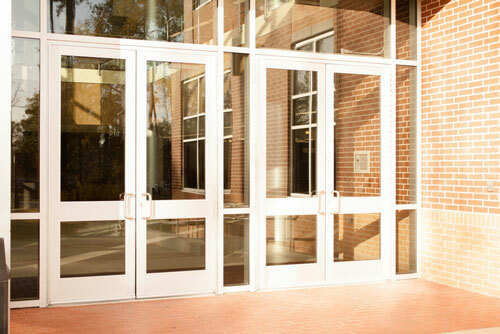 There are almost as many styles of doors as there are commercial enterprises. A restaurant may want something with a little flair, which a business park is looking for something utilitarian or industrial. Twin City Glass Co. can handle both and everything else. No matter the material, we can build doors that look good, handle the amount of use it will get, and stand the test of time. In addition to doors, we offer several styles of closers that will keep the door from slamming shut, which will help the longevity of the door. Other accessories, such as door push/knobs, bars, and even mail slots can be built into the customer’s specific style and demands. Whether it’s a small bistro on Main Street or an 80,000 square foot office building, Twin City Glass Co. has the experience to get the job done. We have been serving the Longview/Kelso area for more than 90 years, let us take care of your commercial glass needs.